Built in 2010 this beautiful Sunseeker Yacht turns head wherever she goes, her sleek lines and contemporary interior make her one of the requested yachts on the West Coast & Mexico. Zero speed stabilizers provide a comfortable platform even when at anchor and are a huge plus on this vessel along with the 24 FT beam which adds to the stability. 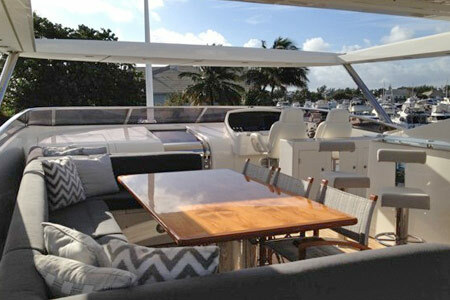 The large aft deck is shaded and a great spot to enjoy outdoor dining. Guests naturally tend to gravitate to the fly bridge which has comfortable seating arrangements, a sit up bar, dining area and retractable sun roof. One of the nicest features of this yacht is the huge sunbathing pad situated on the fly bridge, which can be shaded with an awning upon request, for those preferring a little less sun. The bow of the yacht offers another sunning area and a quiet place to relax in comfort or take in the sunset. 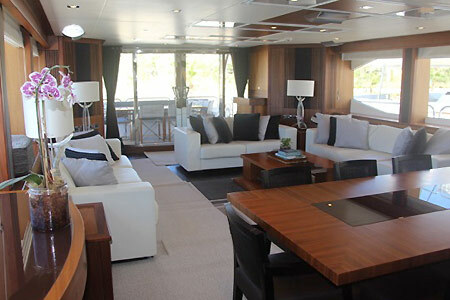 The yachts� interior is tastefully furnished in white leather which compliments the hard wood floors. Four deluxe staterooms with full bathrooms can accommodate a total of eight guests for overnight trips. 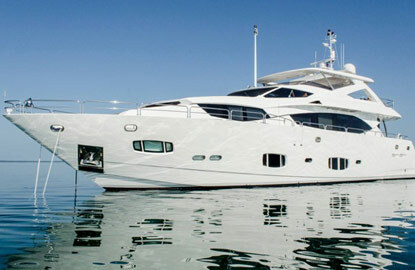 This yacht offers guests superior accommodation. The master suite is on the main deck and features a large seating area with television, comfortable bathroom, walk in closet, and separate lower area offering a king size bed. The VIP cabin is full beam and considered to be the 2nd master located down below amid ship. It offers a massive walk in closet, small desk area, seating area, beautiful bathroom, and a great HD TV with premium sound. The other (2) guest cabins mirror each other with (2) twin beds, closet, television and beautiful bathrooms. For the ultimate in comfort and style this is the yacht of choice. Yacht Emrys has a knowledgeable, professional and fun-loving crew who are waiting to provide you with a magnificent charter holiday. The yacht is available for charter in the Sea of Cortez the winter of 2015, West Coast USA summer of 2015and the Caribbean/Bahamas winter of 2015/2016. Includes: Two Meals per person, margaritas, beer, bottled water and soft drinks. Premium wines and liquors available for purchase. Includes: One meal + appetizers per person, margaritas, beer, bottled water and soft drinks. Premium wines and liquors available for purchase. Includes: One meal per person, margaritas, beer, bottled water and soft drinks. Premium wines and liquors available for purchase. Includes: Appetizers, margaritas, beer, bottled water and soft drinks. Premium wines and liquors available for purchase.